1940’s Women in WW2 Memorabilia. Uniforms, fashion, hairstyles, beauty advice, knitting and sewing patterns. 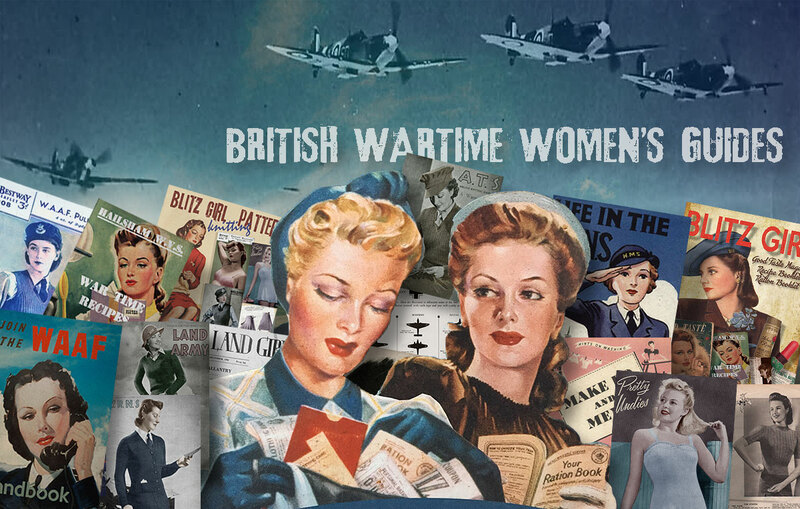 For British Women like the WAAF, the WRENS, the W.V.S, the ATS and the famous LAND GIRLS. And American Women like the WAVES, the SPARS, the WAC, the WASPS, the NURSES and the iconic Rosie the Riveters. Bargain Bundle Price : $15.99. 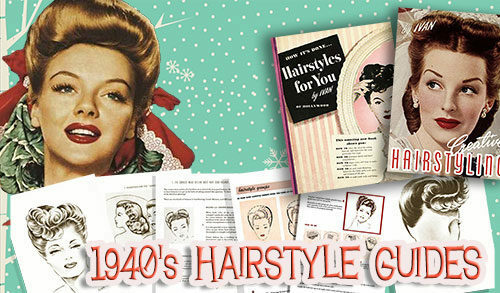 Original booklets, manuals, pamphlets, magazines, sewing and knitting guides. Read by British women who served during the war, in uniform and on the home front. Download all British Wartime Guides : $9.99. Scroll down for more details and some sample images. The Women’s Auxiliary Air Force was formed to help the RAF and was under direct command of the RAF. They played an integral part in the country’s defense, especially at Biggin Hill where they helped co-ordinate the entire Battle of Britain, once famously during a direct hit during a bombing raid. This pretty little pattern for a slim fit Waaf jumper was designed by Finella of Wife and Home. A compendium of handbooks, magazines, war recipes, and knitting patterns owned by British women during the blackout days. The Blitz was an abbreviation for Nazi Germany’s Blitzkrieg or ‘lightning war’ against Britain in 1940 and 1941. The feisty British woman has been personified in many films with her defiant red lipstick and rolled hairstyles, game fully swapping stockings for painted seams and gas masks. 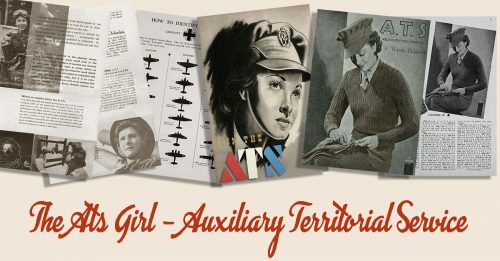 The women of the Auxiliary Territorial Service filled countless vital roles – radio-location, surveying the skies for enemy aircraft, dispatch riders, theodolite operators and many more. A copy of a typical WLA Newsletter. 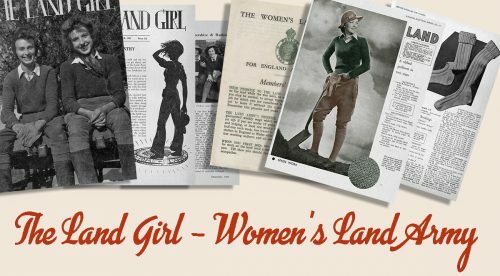 Land Army Pullover and Stockings pattern booklet from Weldons. 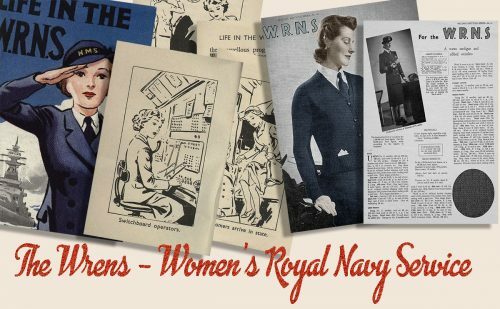 of the Women’s Royal Navy Service. W.R.N.S Weldons Pattern pamphlet for a warm cardigan and wrist-lets. 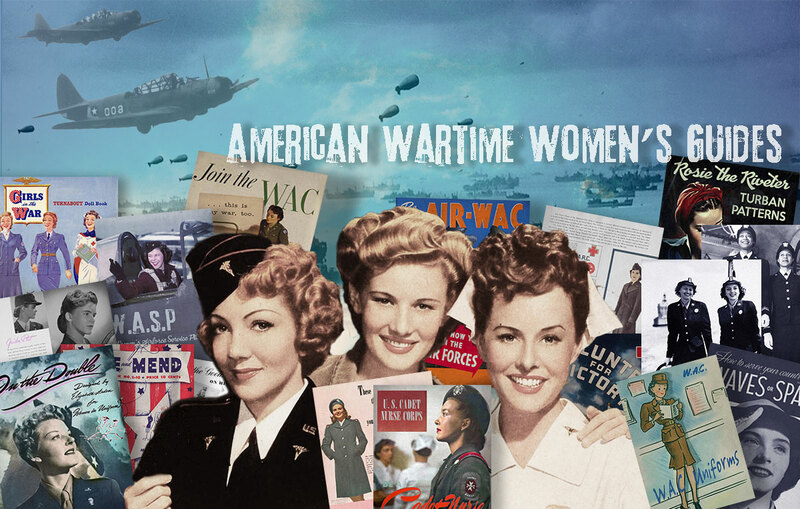 Original booklets, manuals, pamphlets, magazines, sewing and knitting guides, read by American women who served during the war, both in uniform and on the home front. American women of every ethnicity, young and old, sacrificed a great deal, giving not only themselves but their sons, husbands, boyfriends, fathers and brothers to the war effort. Buy the American Wartime Guides Pack now : $9.99. 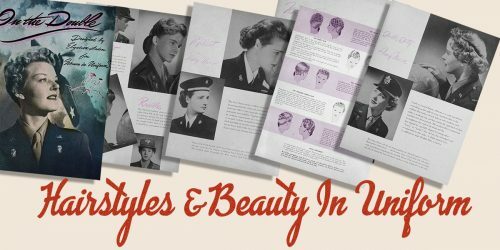 A rare and wonderful book by Elizabeth Arden offering sterling advice to women in the various uniforms of the forces; on how to match their hairstyles and makeup to their military hats. Perfect for the 1940s re-enactment enthusiast. A wonderfully illustrated clothing pattern guidebook for all American women. 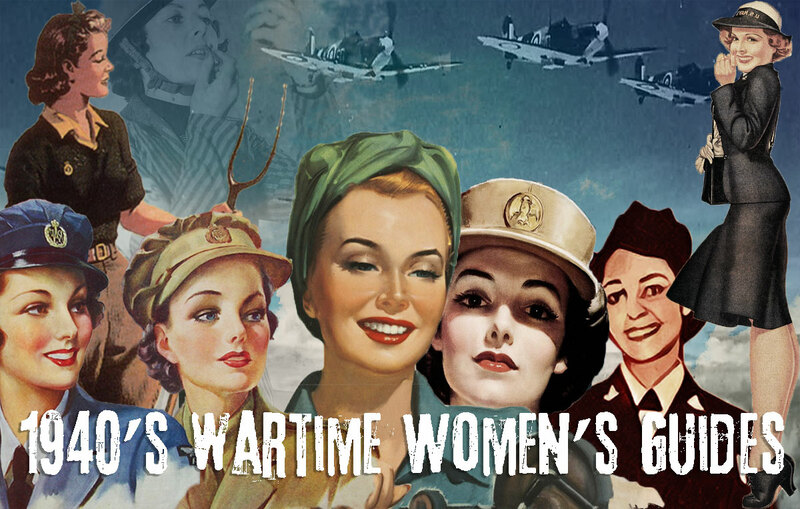 It’s a great time capsule of the typical daily wardrobe of women in the war years. In it you’ll find precious Vogue and Hollywood patterns for skirts, jackets, boleros, head pieces. This really is a gem of a book. Turban knitting patterns for the iconic WOW’s ( Woman Ordinance Workers), better known as Rosie the Riveters. Life in the WAC – A Women’s Army Corps recruitment handbook. Beautifully illustrated reqruitment book which emphasises the fun and glamour of being an army WAC. The full kit and caboodle worn by army WACs and WAC nurses. Invaluable information for the vintage 1940s re-enactment enthusiast. The US airforce had a special wing of Air Wacs who filled so many roles in war zones across the globe. the SPARS ( United States Coast Guard Women’s Reserve). While all the women’s forces uniforms were smartly designed and tailored, the Waves / Spars summer and winter uniforms were the envy of all – for they had their very own New York couturier, the one and only Mainsbocher. Under the Red Cross banner, women served courageously as nurses in both army and navy units across the world during the war. Army Red Cross / Army Nurse Corps pamphlet. U.S Cadet Nurse Corps recruitment book, including uniforms, lifestyle guides etc. You can also see the typical Army Nurses wardrobe kit in the WAC Uniform booklet ! A rare copy of The Avenger, a twice monthly newsletter named for the WASP base at Avenger Fields, near Houston Texas, where Jacqueline Cochran established the Women’s Air Force Service Pilots. The group was disbanded after the war with no veterans’ benefits. A set of cute A4 printable digitally restored vintage 1940s paper dolls. Just print, cut and dress up ! 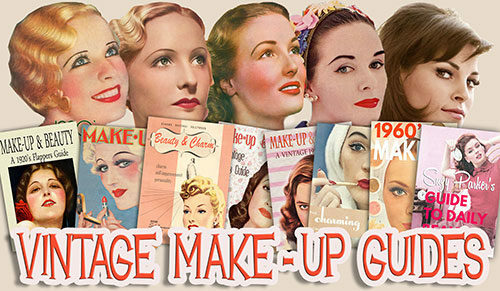 Save 30% with the Full Bundle Pack plus get this 1940s Wartime Beauty Pack !